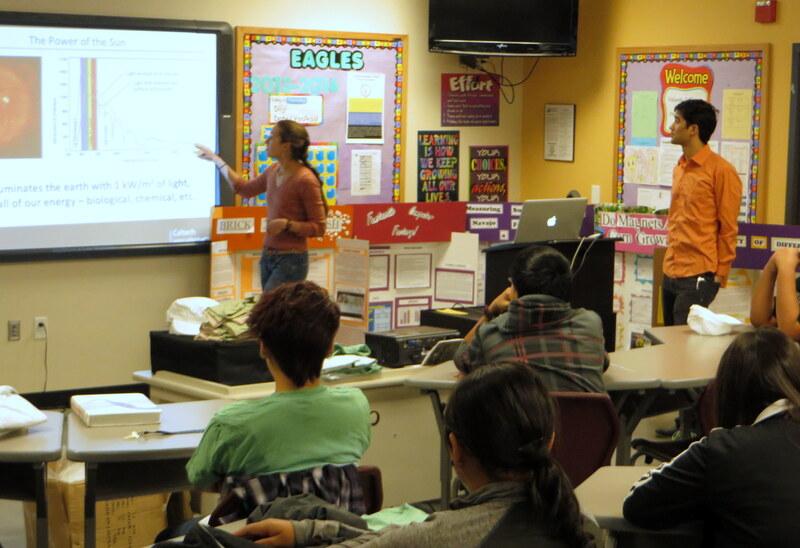 Evan Miyazono and I recently visited Navajo Preparatory High School in Farmington, New Mexico, the second half of the first exchange of visitors between Caltech and Navajo Prep. Two students and two teachers from the high school visited our campus last summer, spending time touring labs, working on small science and technology projects, and sharing their background and thoughts on science education in the Navajo Nation with us. Evan and I were happy to return the favor and take a trip out to Farmington. We spent the school days giving lectures about light and solar power to the underclassmen and having discussions with the seniors about college applications, college life, and graduate school. We took over physics classes for the entire freshmen class, and spent an hour and a half with each class teaching them the basic E&M they needed to know to understand the wave nature of light and walking them through some simple experiments with lenses and diffraction gratings. When Evan put a piece of paper on which he had cut two very thin slits in front of a green laser-pointer, “oh”s and “ah”s bubbled up from the students as they saw the diffraction pattern appear on the other side of the room. During a math class where Evan was demonstrating how the area and circumference of a circle are related in an intuitive way by breaking up the area of the circle into a rectangle with sides r and pi*r, from where I stood to the side of the classroom, I could hear a student exclaim to his friend “Math is amazing!”. The next day, after I gave a presentation to the freshmen physics classes on solar power and photovoltaic cells, four students asked for help or resources for their science projects. Two students were making a working model of a “modernized Hogan.” The school has a hogan in the middle of campus where important ceremonies and traditional Navajo gatherings take place. The students want to build a table-top model hogan with working solar water heating and photovoltaic panel to provide warm water and lighting. Another student is working on making a smart phone app for visitors to the Navajo Nation as her senior project. Her app will inform tourists about Navajo landmarks and the significance they hold to the Navajo people. She wants to inform visitors about her culture in an effort to replace the many stereotypes held about native people and Navajos in particular with factual information. These are just a few examples of how students are honoring the traditions of their culture while also taking advantage of new technology and empowering themselves through science education. I shared with the students stories of friends of mine who had grown up on the Navajo Reservation and the unique issues they confronted in college and afterward. Students who come from tribal reservations often experience homesickness to a much greater degree than other groups when they go away to college. Many of these young adults are accustomed to a very tight community and strong sense of belonging and support that they feel in their hometown, so leaving that community to join a huge group of strangers with cultures foreign from their own can be a big challenge. 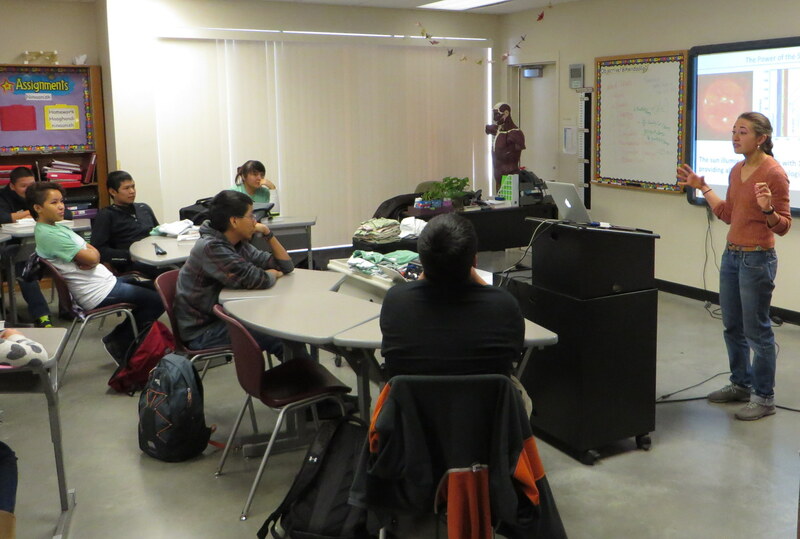 I gave an informal seminar to the senior class where I discussed college in general as well as issues specific to native students. I gave them advice gleaned from my own experiences as well as the experiences of some of my Navajo friends. Evan and I also answered tons of questions that the students had about all aspects of college—getting in, financial aid, being successful, and finding balance. They asked how to approach a professor about doing research in their lab and how to budget their finances, what kind of summer job they should look for, and how to balance family life and ties with college life. The seniors had so many questions that together we spent more than two hours discussing these topics and answering general and specific questions. I was really happy we could provide so much useful and desired information for these young scholars. In our free time Evan and I got to spend more time with teachers and students, sharing meals, information, and ideas. It was great to get to know the students and teachers better and learn more about their perspectives and experiences, and how education is fitting into their lives. I look forward to continuing to develop these relationships from afar. We already have plans to mentor a couple of students with their science and senior projects and hope to recruit more Caltech grad students to serve as mentors. Supporting and encouraging these native students in their participation in math and science fields, and higher education in general, as well as helping them to maintain a strong commitment and connection to their culture and families is something that I want to continue to foster as a mentor and ally of the school. I want to thank IQIM for providing the funding for this trip that made these connections possible. Take the unit outside and place it on a suitable work bench. counseled before choosing one to do the work for you. in their homes simply by pumping cool air in.